If your mom is a gardener, you are lucky! Not just because she is an awesome person, that is what gardeners are ;), but also it is very easy to find her a meaningful mothers day gift. A gardening gift. The nice thing about gifts for a gardener is that they come for all budgets. If a child only has a dollar, there are nice gardening things for a dollar. If a child wants to get all fancy, go ahead, the ideas are endless. 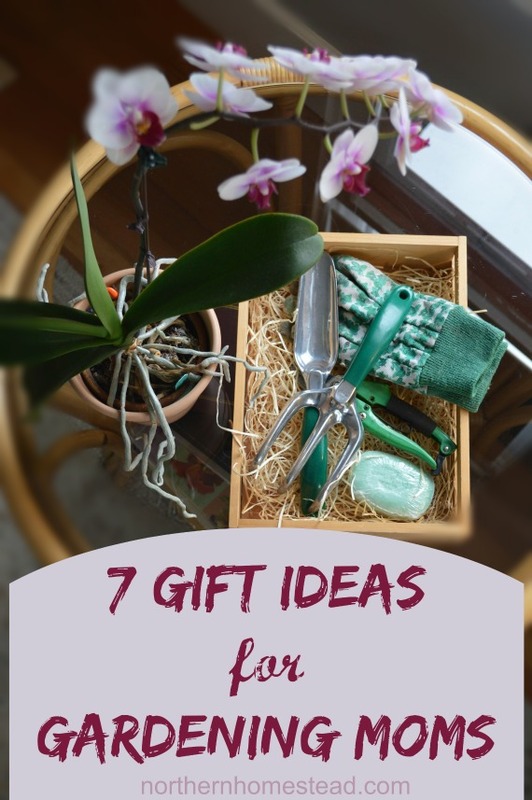 So let’s get started with 7 Gift Ideas for Gardening Moms. The pictures are all Amazon affiliate links. This is a classic. A gardener can never have too many gloves. I prefer the fabric gloves, they are just easier on the skin, but they rip fast. So I constantly need new ones. There are very pretty gloves, so get creative and your mom will love them. Again, something a gardener uses all the time. After a season they are usually all worn out. And even if they aren’t, it is convenient to have more than one set ;). They come in different styles and shapes. Some do a better job with hard things like pruning brunches, some are better for pruning herbs. So any gardener needs more than one. And if you know that your mom already has two, go for a Hedge Shear. Is your gardening mom organized, or does she need to get more organized? She would love to have one of these super handy bucket caddies. But do not give her a bucket, unless you fill it with flowers – I think that would just melt her heart! If your mom is not as young anymore, but still gardens, she would love some help with a work seat, to kneel or to sit on. They are a big help when spending hours in the garden. Besides, she just might take some more time to rest, while still in the garden, and thank God for you and your thoughtful gift! Does your mom like gardening but just loves shoes? (women tend to do that) Get her some shoes, gardening shoes, how fun! A book is a great gardening gift that can be enjoyed beyond the gardening season. When snow covers her garden, your mom will just love a good gardening read. Well, there are many more ideas what gardening moms would enjoy. But if you just keep it simple with some beautiful flowers, she will be thankful too. After all, she IS a gardening mom. Enjoyed this post? Don’t forget to subscribe to NorthernHomestead and follow us on Facebook or Pinterest for the latest updates. Thank you, Anna! I am building a gardening “basket” for my mom, and these are great ideas, but I especially love the gardening shoes! I want them all! I go through gardening gloves pretty regularly. I’ve never had gardening shoes. That would be a neat gift. And that gardening book would keep me occupied for hours. Great gift ideas, Anna! Well, just make sure all your kids read this post AND your comment :). Gardening gifts are so fun! Great list for gardening Moms, Anna. As a gardening Mom, I have everything except the Bucket Buddy and the Rolling work seat. I LOVE that Bucket Buddy!! I carry my tools around in a basket or bucket but that one would be even better. I like to put pulled weeds into the bucket as I’m working, having the tools on the outside would be wonderful. I know, I like the Bucket Buddy very much too. Handy and looks nice, makes working in the garden even more fun! Ahhhh…so much great ideas! I love that you said gardening gifts could be as cheap or as expensive as one can afford! Great ideas! Absolutely, there are great gardening gifts at dollar stores. Thank you, Jess! Yes, I would agree those are year round gift ideas. Welcome, nice to meet you! Northern Homestead is a blog about urban homesteading in a cold climate. We write about growing, raising, preserving, and preparing our own real food. Some posts include affiliate advertising links to Amazon Services LLC Associates Program, which give us a small percentage of the sale at no additional cost to you.